If you have tried looking at an optical illusion, you might have asked how your eyes tricked you into seemingly seeing things that aren’t there. Optical illusions deceive your eyes by appearing to be other than it is. It’s not your eyes’ fault, though. It has more to do with how your brain and your entire visual system perceive and interpret images. You get visual illusions because of the properties of your brain’s visual areas as they receive and process information. These occurrences are not random anomalies or errors of our mind. In fact, there is a whole area of science dedicated to studying them. Some scientists theorize that optical and visual illusions are a byproduct of our mind trying to save energy processing information. Susana Martinez Conde, director of the laboratory of visual neuroscience at Barrow Neurological Institute in Phoenix, Arizona says that optical illusions are a phenomenon in which our subjective perception doesn’t match the physical reality of the world. To better understand what an optical illusion is, scientists help us differentiate optical illusion from visual illusion. According to them, optical illusion arises due to some properties of the eye while a visual illusion explains why the perceptions occurs. Floaters are the best example of an optical illusion. They occur inside the eye and seem to float in your field of vision. They could appear as small specks, spots, and shadowy images. Others could even see floaters as bright white snow or flashes of light. Tiny irregularities in the fluid that fill the eye caused floaters to surface. This is increasingly common as you advance in age. The visual system responsible for this process includes the eye, the optic nerve that links the eye to the brain, and the primary visual cortex, which processes the visual information. A good example of a visual illusion is when you see stars after your head receives a hard blow. Vision scientist Michael Bach, says that you seem to see stars because of the mechanical stimulation and activation of the neurons in the eye. Your brain misinterprets this as light. Even if a light doesn’t enter your eye as you hit your head, your visual system perceives it that way. Some professionals are trained to ignore visual illusions for the safety of the work they are doing. Pilots are trained to ignore the visual illusion of seeing false horizon while in flight or seeing a narrow runway when landing their aircraft. Visual illusions are also used for safety measures. Stripes on the road that are painted closer give drivers the illusion that they’re speeding up so they would slow down. The actual idea is to prevent accidents by stimulating drivers to slow down as they approach the sharpest curve. Scientists want to gain new insights on how vision and the brain work. Visual illusions widen the mental horizon and candidly point out that things aren’t what they seem. While visual illusions provide an entertainment value, they help scientists understand how visual processes work in the normal and in the diseased brain. In a way, this perception served us an evolutionary purpose. But now they are just a reminder of the way we are used to see. 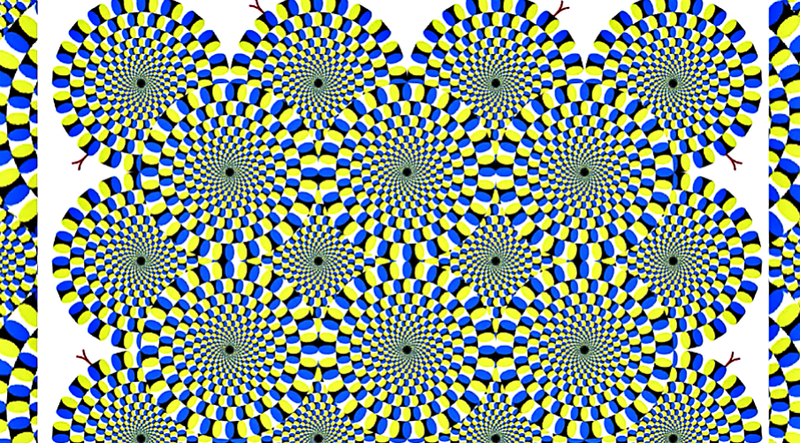 The neurobiologist, Mark Changizi, has another view why you see visual illusions. According to him, you see visual illusions as an attempt of your brain to “see” the future. This occurs during the slight time lag after light reaches the retina in your eye, right before your brain has the chance of translating it into a visual perception. Changizi explains that in an attempt to generate a perception, the brain takes a guess at the near future by trying to fast forward a tenth of a second. This “neural delay” prevents you to perceive an image as it actually is. Instead, you see them as you expect they might soon to be, which doesn’t actually match reality. Martinez Conde elaborates further that the brain is a limited structure with limited resources. Visual illusions might be the brain’s way of taking shortcuts. The brain might also need to quickly give more importance to some features in a visual scene than others. Whatever the case, optical illusions are brain teasers that we enjoy doing and taking on as challenges.